Since the early 1980s, Texas has hosted two quirky annual festivals in spite of its most common pests: The Great Texas Mosquito Festival and FireAnt Festival. One tiny Texas town also established a festival commemorating its pesky wild hog population. 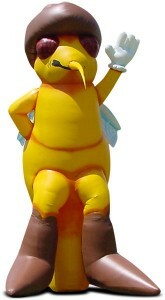 Willie-Man-Chew, mascot for The Great Texas Mosquito Festival and the world’s largest “mosquito,” according to festival organizers, is 26 feet tall. Houston and Dallas-Fort Worth ranked on Orkin‘s list of top 20 cities for mosquitoes in 2015. Each metropolitan area was ranked by the number of mosquito customers serviced in 2014. The festival, always held in Clute, will be celebrating its 36th anniversary July 28-30. Willie-Man-Chew is the world’s largest “mosquito,” according to festival organizers, standing at 26 feet tall. The festivals entertainment headlines include Texas country singer Roger Creager, the 80s cover band The Spazmatics and country music artist Andy Griggs. Festival-goers can participate in a Mosquito Chase 5K Run, a BASF-sponsored Kids Run, horseshoe- and washer-pitching tournaments, a barbecue cook-off, bingo, haystack dives, a petting zoo and mosquito-calling contest. Marshall has been celebrating its fire ant population with the FireAnt Festival since 1981, which is celebrating its 34th anniversary Oct. 9-11 in Marshall, Texas. Red imported fire ant populations cost the United States more than $5 billion annually for medical treatment, damage and control of infestations. This doesn’t include the $750 million in damage they do to livestock and crops. Attendees can participate in a FireAnt 5k run, vendors, a parade, dancing contests, a fire ant-calling contest, a Tour De FireAnt bike race and live entertainment. The headliner is dance band group Robin & The Mystics. Wild hogs in the South cause millions of dollars of damage each year, according to parade.com. Ben Wheeler, the “Wild Hog Capital of Texas,” has been celebrating its annual Fall Feral Hog Festival since 2007. The late Brooks Gremmels, co-founder of Ben Wheeler Arts and Historic District Foundation and the founder of the festival, told tylerpaper.com he started the festival to poke fun of nuisance the wild hogs cause. The hogs eat crops and animals in the area, and can disrupt livestock and farming operations by damaging facilities and fences. The festival focuses around a wild hog cook-off and crowning of a Hog Queen. Have you heard of any other festivals celebrating pests? Comment below.